It was the largest pipe organ in Iowa. This glorious Casavant organ, with four manuals, 94 ranks, and 5,122 pipes, was dedicated on April 29, 1984 at Wesley United Methodist Church in Muscatine, Iowa. The congregation was eager for me to visit their church and try out the organ. Now it lies in ruins. Last Monday night, severe weather battered the state of Iowa, spawning high winds, hail, intense rain, and tornadoes. Clocks indicate that at 10:10 p.m. the electricity went out at Wesley UMC. 115 mile winds ripped through the town, with a tornado headed right toward the church. 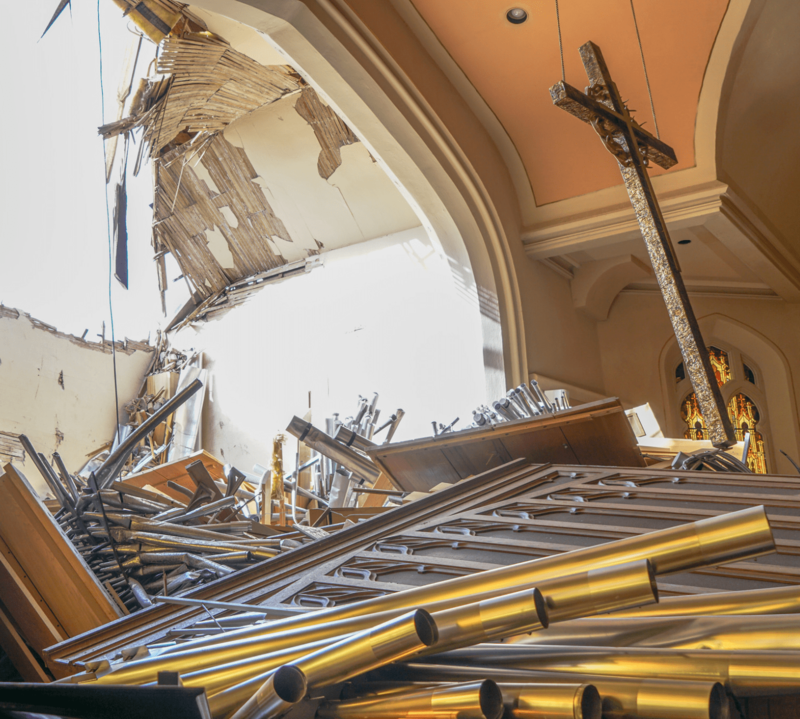 In the blink of an eye, the roof at the front of the sanctuary was torn off and the organ was completely destroyed, with woodwork and hundreds of pipes collapsed onto the floor, twisted, bent, and shattered. In addition, the adjacent Family Life Center had a huge in its roof. Miraculously, the only thing left untouched at the front of the sanctuary was the cross, hanging by a few chains from the ceiling. On Tuesday afternoon, I was able to visit Wesley UMC and talk with pastor Bruce Ursin, his wife Susan, organist Sally Potter, and Director of Media Ministries, Katie Roquet. My first reaction was visceral, coming from deep in my heart. How could this be? What kind of power could throw around 5,122 organ pipes and leave them in a twisted heap? 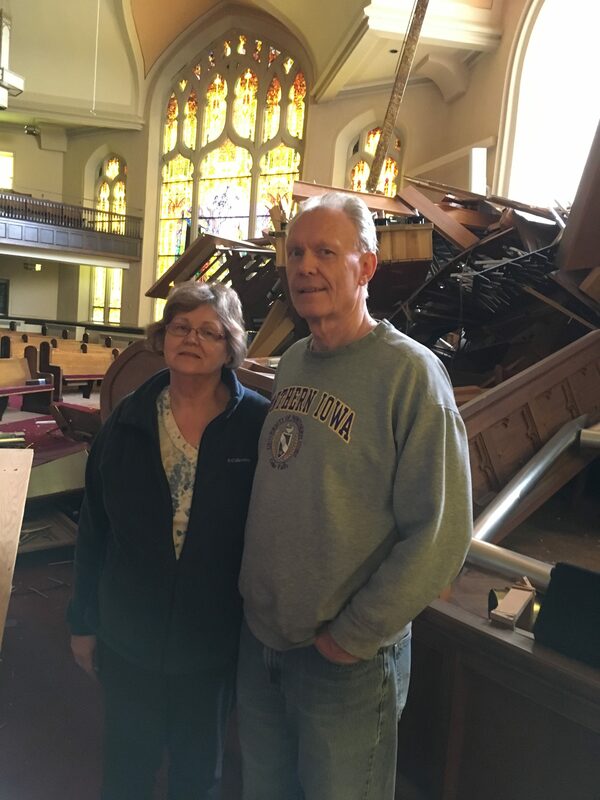 I felt a mixture of awe to find a jewel of a pipe organ in a town like Muscatine, grief at the devastation, and gratitude that most of the rest of the church was intact. Jesus, keep me near the cross. After shedding a few tears, I simply walked around the sanctuary, examining the damage and meditating upon the magnificent and irreplaceable stained glass windows that were spared. The Wesley United Methodist Church building was constructed in 1912, and the sanctuary is gorgeous. The original Skinner pipe organ lasted for seventy-one years, when it finally needed to be replaced. The Organ Committee retained Robert Scoggin as their organ consultant and recitalist for the dedication. Not only was Scoggin an outstanding organist who studied with my organ teacher, Robert Baker, but he was also a United Methodist elder. Scoggin traveled the country, visiting organs constructed by contemporary builders and discerning how the new organ in Muscatine could lead and enhance worship, function as a concert instrument, and also serve the musical needs of the community. Pipe organ construction is extremely complex, sensitive, and expensive. This organ was made possible by the Jackson Trust. Robert S. Jackson, a Muscatine attorney, church member, and music lover, died in 1979 and left a major portion of his estate to the church to be used for the music program, including a new organ. There is also a Jackson concert series. According to the church website, “From the first concert by soprano, Louise Russell, in 1981, the Jackson Concert Series continues to present musical concerts by artists of distinction. Over the years we have been privileged to provide the community with concerts by Roger Williams, Bobby McFerrin, The Four Freshmen, Jerry Hadley (20th anniversary of the series), Marvin Hamlisch (25th anniversary), Simon Estes, many great organists, and also some of the most celebrated jazz bands and vocalists. The series is varied and has something for everyone – from the opera buff to the jazz aficionado to the child in all of us. To date we have presented over 175 artists free of charge to our community.” How incredible is that for a town of 23,000 people? As one who devoted ten years of my life to playing the organ, I was utterly amazed at the story. I have no doubt that the Jackson organ will be rebuilt and will continue to glorify God again. Yet, there is much more going on here. God is already at work, transforming hearts and lives through the witness of Wesley UMC. In the cross of Christ I glory. The very day after the storm, church leaders made a decision to become the communications hub for storm damage in the Muscatine area. Their website, wesleyonline.org, is a clearing house for information about the storm. Is it any wonder when you read their mission statement on the home page, “Transforming lives through hands-on ministry with children and families in need.” And their vision is, “Growing together in Christ, reaching out in love.” After all, the organ is at the heart of Wesley UMC, and the congregation, as the largest church in town, is at the center of the community. The church is used for school concerts and other community events. Director of Media Ministries, Katie Roquet, explained that so many people have stepped forward and offered to help the church in any way they can. Yet Pastor Bruce and church members want to use this tragedy to share Christ’s love, encourage each other, and reach out to others whose homes or businesses were damaged by coordinating volunteers. Wesley UMC refuses to lament and instead seeks to look outward and make a difference in the community. In that old rugged cross … a wondrous beauty I see. Sally Potter has been the organist for decades, and Pastor Bruce is a skilled, spirit-filled pastor. The discipleship pathway of the congregation includes connection, growth, serving, and missions, which is why Wesley UMC has a partnership with Franklin Elementary School. The children at the school sent a banner and messages of love and support to the church last week, with one 2ndgrader writing, “I feel so very sorry about the tornado, but want you guys to know that I love you. I drew you a rainbow so you wouldn’t feel sad.” In the Cross of Christ I Glory. What a witness Wesley UMC is making! It’s all because the cross is at the center of this church’s existence. Is it any coincidence that, after the massive destruction of the chancel and the organ, the cross was unscathed? The cross, symbolizing Christ’s self-giving sacrifice, reminding us that no matter what happens, God is with us, strengthening us to reach out to our world in love. Last week organist Sally gave me a copy of the 1984 dedication service for the new Casavant organ. As part of the dedication, the congregation read these words, “We dedicate this organ to the healing of life’s discords, and the revealing of the hidden soul of harmony, to the lifting of the depressed and the comforting of the sorrowing, to the humbling of the heart before the eternal mysteries, and to the lifting of the soul to abiding beauty and joy, through the gospel of infinite love and good will.” Lift High the Cross! Wesley UMC, I can’t wait to see what your new organ will look like! And, yes, as I promised last week and, God willing, I will play a piece at the dedication of the organ, all to the glory of God. Prayers as the restoration process begins. How tragic. Brought tears to my eyes as I looked at the mangled and bent pipes. What a glorious witness you all are. We love you so much. As a member of Wesley UMC, I want to thank you for coming to the church last week and also for this wonderful blog. It has been really hard to look at the chancel and see the piles of wood and metal, but seeing that cross hanging from the ceiling gives all of us hope. I will be waiting to hear you play at the dedication of the new organ–whenever that may be. Thank you Bishop for the beautifully written blog. The pain and the joy are present and experienced through your words. God bless you for loving and caring so deeply. Our prayers are with the people of Wesley UMC and Muscatine. What a difficult time. May God give them strength. This happened at Coventry Cathedral in England, too, when the cathedral was bombed during World War II. Just the altar and cross were left untouched while the rest was in ruins. What a wonderful witness to the community of Muscatine! Such a beautifully written piece honoring Muscatine UMC’s continuing musical legacy! I was touched by your heartfelt sentiment, Bishop Laurie! Prayers to their congregation as they rebuild their church and lives. Your passion and empathy are evident. No words, just tears… of sadness and joy! This makes me so proud to be a Christian and especially a United Methodist. Being an Adult Sunday School leader…I would like to share this with my SS class this coming Sunday. Our prayers will be with all involved in the storm. My heart goes out to you all as you begin the restoration process. This breaks my heart, as I, too, am a church organist. The untouched hanging cross is evidence of the presence of God even in the midst of strife. God’s blessings on you all. you are a true witness to the Christian faith.